I’m a creative director and designer residing in Orlando, FL. I’ve done work for large and small non-profits of all sizes, like Florida Hospital (now Advent Health), Northland Church, and YMCA. I also teach print, web, and UX design at Valencia College. I love research and have a passion to build brands and create collaborative environments. I’m a creative director and designer residing in Orlando, FL. I’ve done work for non-profits of all sizes, like Florida Hospital (now Advent Health), Northland Church, and YMCA. I also teach print, web, and UX design at Valencia College. I love research and have a passion to build brands and create collaborative environments. 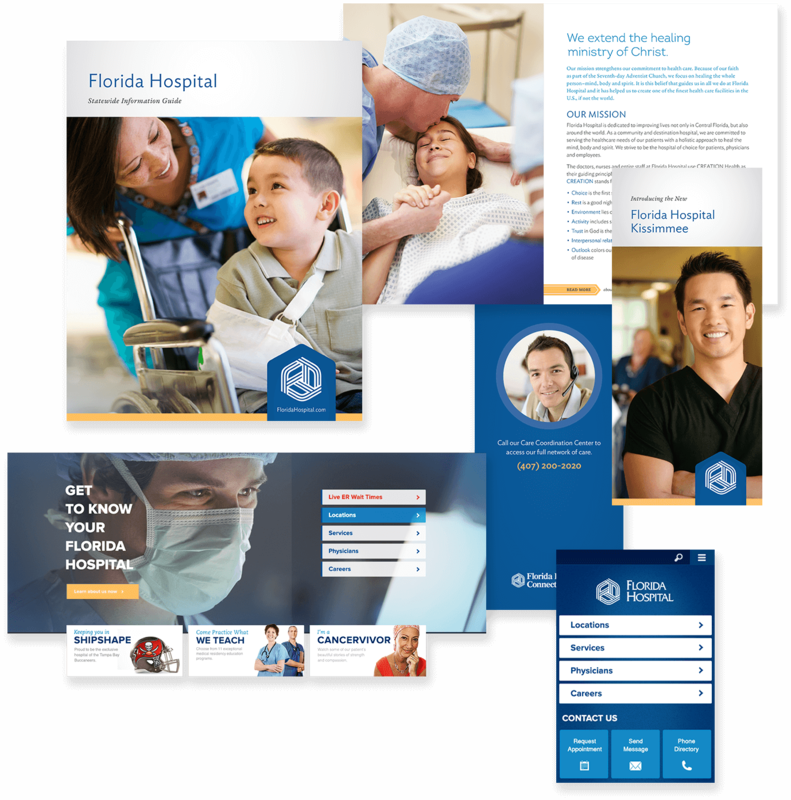 The Florida Hospital brand was tired, from a visitor’s online experience to the brochure collateral they would receive in their doctor’s office. 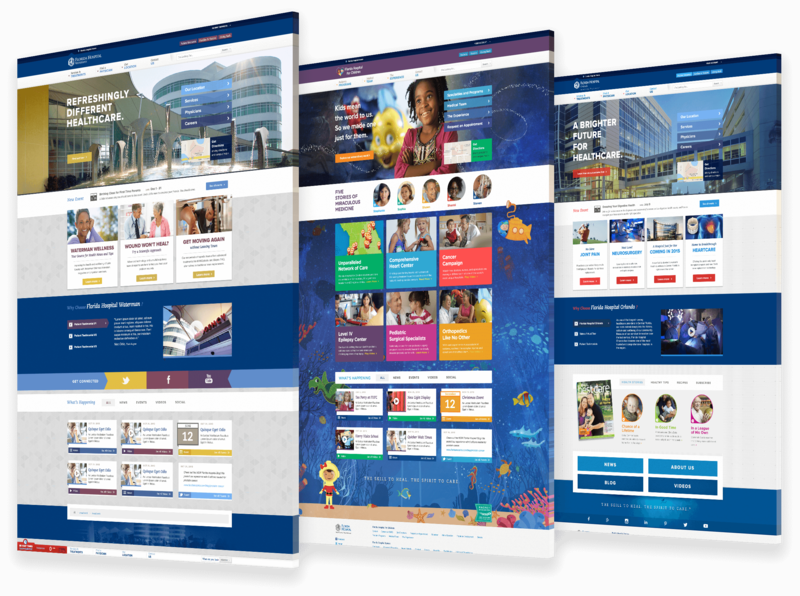 We wanted to refresh the brand, touching all but the logo, to give visitors a fresh look—emphasizing FH as the family-centered hospital and source for modern medical expertise. We looked for ways to highlight specific moments, within our our hospitals, where unmet needs and desires turned into connections. This gave birth to new methods of creating and connecting our print and digital collateral, giving our viewers additional opportunities to engage. Florida Hospital created its Creation Health department to encourage wellness in and out of the workplace. But the material often got lost in a din of emails and pamphlets. I hosted a series of design thinking workshops between the staff and our creative team. Together, we created a fun, loud, sassy brand that stuck out in mailboxes and on office bulletin boards. 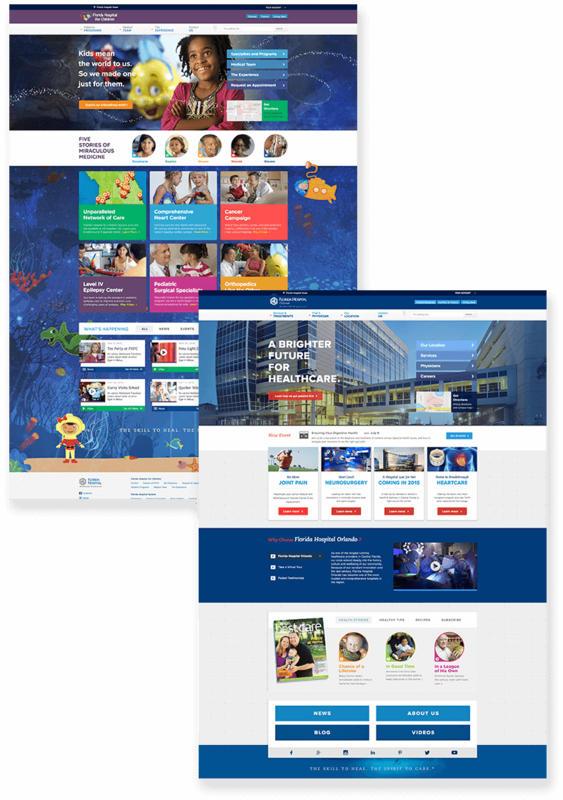 Moreover, we developed more meaningful calls-to-action and methods for every interaction with the Creation Health Employees team to be fun and enjoyable. When I first started working for FH, there were 24 campuses throughout Florida, with 24 unique personalities, and 24 disparate websites. When people thought of FH, they thought only of their local FH. We wanted them to be aware of the strengths of having the largest network of hospitals, doctors, and expertises—so they could come to us with whatever they needed. I traveled to each campus to assess its personality, then art directed photo shoots, and coordinated with our team on new campaigns. We also created a new template that highlighted differences in color and texture, while retaining the same brand look. After a year, web traffic increased 400% and leads by 300%. 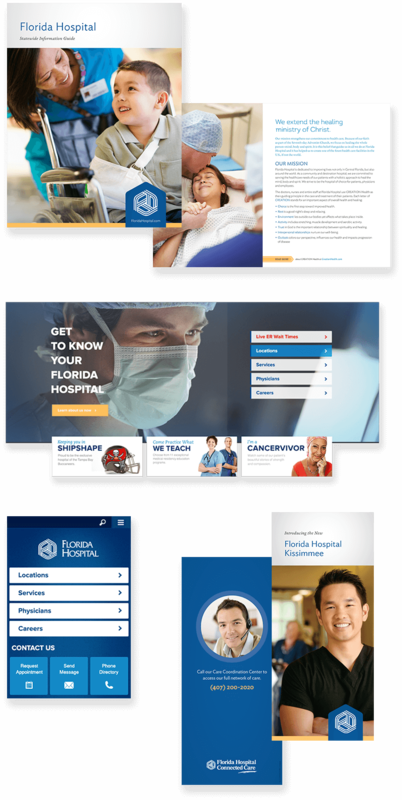 FH is the largest healthcare network in the South, which plays a large role in our marketing materials. However, our focus group testing revealed people preferred a more personal approach for personal matters…such as discussing medical records. So we shifted to our more personal voice and friendly-education moments. We also built tools to help people find and schedule with the doctor of their choosing. And we continued to pay attention to our patients by conducting empathy safaris, interviews, and user testing. The previous Northland logo was dated and four different versions were being used over 60 departments and ministries, diluting the brand. It was confusing, lacked brand recognition, didn’t speak of who Northland really is. To support the Northland community, we created studies that complimented the weekly message. Over the last two years, my team produced 18 group studies available via book, weekly worship guide, our website, and a custom app. NorthlandChurch.net has gone through many iterations, mostly in efforts to keep up with the vast amount of content and free resources they provide to their weekly visitors from around the world. 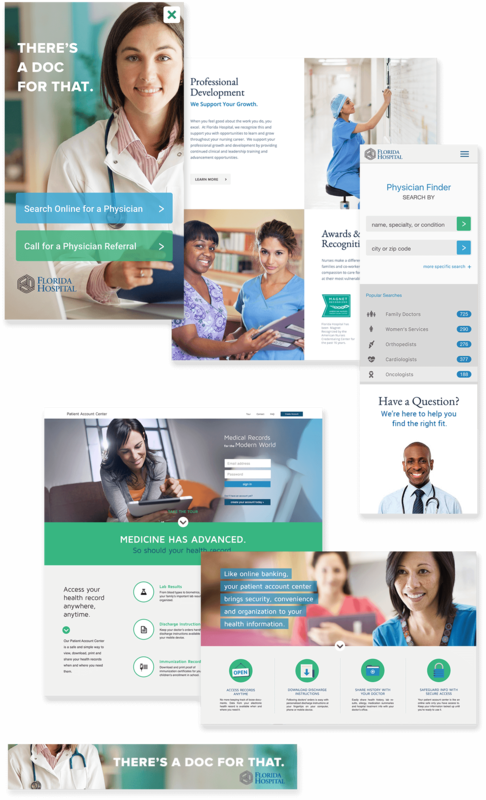 But a recent shift in leadership and staffing required a dramatic shift in web and social strategy—namely, building a structure that exists entirely in a CMS system where a team of content editors could maintain the site. 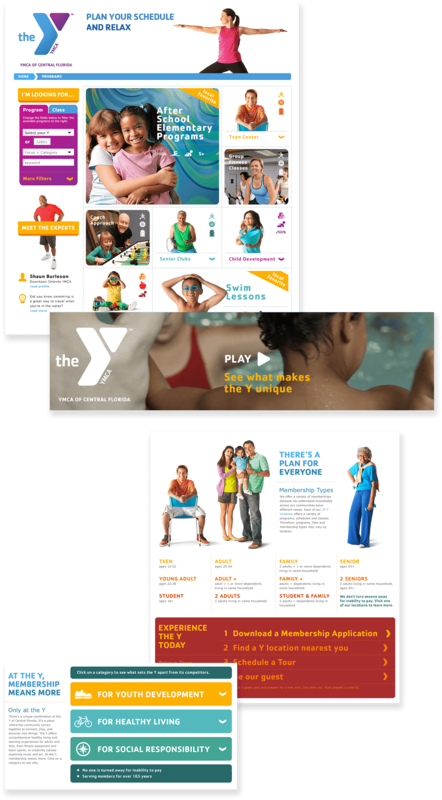 The Central Florida YMCA wanted to improve membership numbers. They learned members involved in regular programs and classes kept their membership longer than those who casually used their facilities. 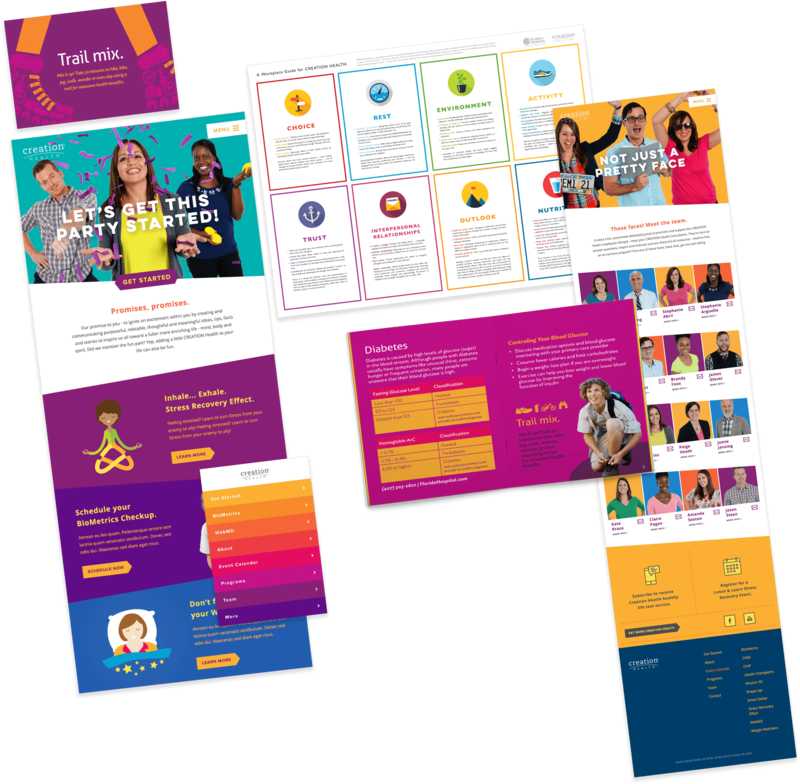 They enlisted my team to create an online campaign that demonstrated the Y’s superiority over competitors and also made it easier to search programs and schedule classes. I’ve spent 15 years designing and creative directing in Orlando, working with large and small teams to create and sustain brands and campaigns of all sizes. I’ve worked with Florida Hospital (now Advent Health), Monet, Valencia College, YMCA, and many more. My work is centered on taking deep dives into subject matter to discover the best methods of communicating and engaging with audiences. I love collaborating and empowering others through education. To that end, I currently teach various design courses at the university level.